Examples of website branding management, streamlined messaging, integration with multimedia and new media communication/outreach tools, revitalization of online business presence and persona. Client: Fit Chick Fitness, an indoor women’s boot camp offered by Aura Lee, owner and personal trainer at Incite Livermore. 1. Optimize web presence to drive business. 3. Integrate with existing online presence of Incite Livermore. 4. Revitalize image of Fit Chick Fitness to match the high-energy boot camp program offered. 5. Simplify day-to-day website maintenance for business owners. 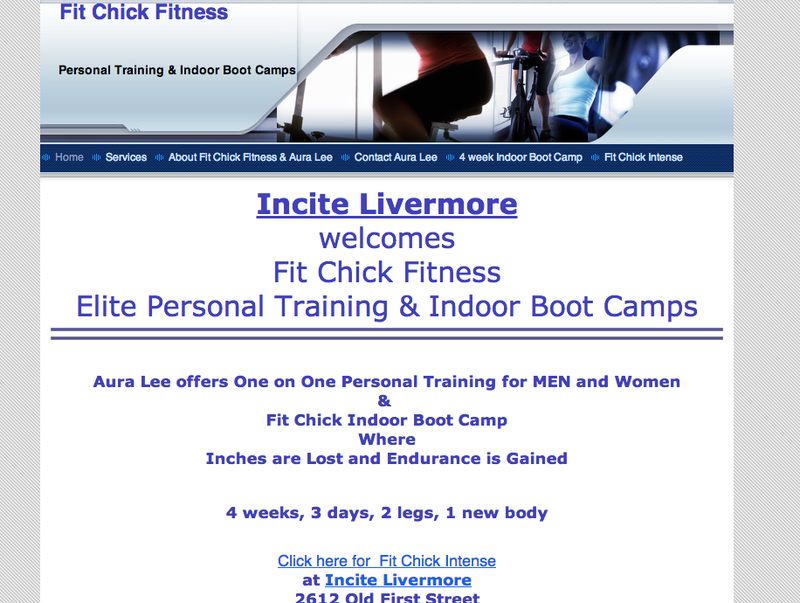 Screenshot of original website for Fit Chick Fitness, a personal training boot camp service offered by Incite Livermore. Overly technical, coding-focused hosting platform prevented quick, timely content updates. Fixed design and graphic elements. Client did not have the skill, time, desire to re-code. Screenshot of Fit Chick Fitness webpage after 2014 relaunch, featuring color scheme to complement brand and updated, sliding images. Intuitive editing for color palate, layout, images, content. Multiple predesigned layouts are also available for quick overhauls. Direct integration with MailChimp, the email marketing software used by Fit Chick Fitness. 1. Optimize web presence to drive business? YES: I selected Wix.com as the new webpage host for Fit Chick Fitness. The software of Wix is optimal for business owners with minimal website backend/coding experience, focusing on the What You See is What You Get (WYSIWYG) presentation of webpage updating. The coding is built-in, and step-by-step updates are provided within Wix as necessary. YES: Integration with PayPal for one-click purchasing and online billing. 3. Integrate with existing online presence of Incite Livermore? YES: Linked seamlessly to Incite Livermore’s Facebook Page, Twitter account, and business contact information. 4. Revitalize image of Fit Chick Fitness to match the high-energy boot camp program offered? YES: New website management host enables WYSIWYG image editing, access to regularly updated royalty-free stock photos, pre-designed and customizable theme templates and color schemes. 5. Simplify day-to-day website maintenance for business owners? YES: Wix offers basic website management for free. Customers can add-on services as needed, an a la carte model to replace the previous comprehensive website management package. This eliminates unnecessary overly technical features and functions and saves the business money by cutting excess fees for unused services. Previous post:Blog piece: Want to Win a Piece of History? Snap & Share #MuniHeritage This Week!